Silent Way is a suite of plug-ins designed for use as part of a modular analogue synthesiser system. The plug-ins produce no sound themselves, nor do they process sound - rather, they generate signals to be used as control voltages (CVs), which can be patched into the control inputs of oscillators, filters, VCAs etc. of an analogue system. By listening to the synthesiser's output signal, the plug-in is able to calibrate itself to generate the appropriate pitch CV for the incoming MIDI notes. �� A VST3 version (macOS and Windows) is now available. �� Added ‘Delay Start/Stop’ buttons to SW ES-4 Controller & SW ES-5 Controller (a workaround for an apparent issue with Ableton Live’s External Audio Effect). ?? Fixed crash when starting the DAW transport if the SW Step LFO Beats parameter was set to zero. �� Fixed UI behaviour in multiple monitor setups with a mix of Retina and non-Retina displays. �� Fixed MIDI output on Gates 6/1-6/8 in Silent Way ES-5 Controller. �� Enabled full support for the Expert Sleepers MIDI & OSC Lua scripting system. �� Added exponential envelope shapes to Silent Way Voice Controller and Silent Way Trigger. �� Added FSK (‘tape sync’) support to Silent Way Sync. �� Silent Way Learner now supports MIDI channel pressure (aftertouch). �� Fixed an issue with MIDI clock generation in Silent Way ES-4 and ES-5 Controllers. �� Fixed the behaviour of the Offset control in certain circumstances in Silent Way ES-4 and ES-5 Controllers, and Silent Way Sync. All Mac OS X versions of Expert Sleepers plug-ins have today been updated again. All have the same small fix applied for compatibility with some older OS X installs. ?? Added support for MIDI output of Song Position Pointer. �� Added support for MIDI output of sysex data to the AAX version. �� Fixed a possible crash when using the OSC browse dialog in 64 bit hosts. �� Added ‘Match Note Offs’ feature to Silent Way ES-4 Controller and Silent Way ES-5 Controller. �� The ES-4 Controller now supports MIDI output at 192kHz. �� The ES-5 Controller now supports MIDI output at all sample rates, including when used with SMUX. �� Added new Run modes and a periodic reset feature to Silent Way Sync. �� Added virtual MIDI input ports to Silent Way ES-4 Controller and ES-5 Controller. �� Added ‘Manual DAC’ feature to Silent Way Step LFO. �� The Audio Unit version now implements Apple’s newer Audio Component API, allowing usage in modern (post-OS X 10.6) hosts that do not support the older Component Manager API. �� Updated Silent Way Soundplane’s OSC support for the new t3d format in the Soundplane Client v1.0 and above. �� Added Silent Way ESX-8CV Combiner. �� Added polyphonic MIDI splitting to Silent Way ES-4 Controller and Silent Way ES-5 Controller. �� Added ESX-8CV mode to Silent Way Voice Controller. �� Fixed a bug which was causing glitches in the paraphonic envelope outputs of Silent Way Voice Controller in poly master mode. This fixes an issue with some 64 bit hosts, notably Presonus Studio One. This is a 32 & 64 bit release compatible with ProTools 11, as well as maintaining compatibility with ProTools 10.3.6. �� Added Silent Way Logic Project. �� Added controls for Interface Categories. �� Silent Way Step LFO can now be reset and/or triggered by MIDI notes and/or incoming CVs. �� Added ‘Gate Length’ control to Silent Way Step LFO. �� Added ‘Random’ feature to Silent Way Step LFO. �� Silent Way CV To MIDI, VST version, can now output MIDI direct to the host. �� Silent Way CV To MIDI can now output MIDI directly to Silent Way Learner. �� Silent Way Learner now supports MIDI polyphonic pressure messages. �� Added ‘SMUX Proof’ mode for Silent Way ESX-4CV Combiner. 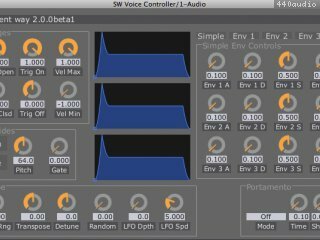 �� Fixed Silent Way Learner, VST and AU versions, to correctly output silence. Public beta of Silent Way AAX. fixed a problem that prevented use of the plug-in status bar (mute, presets etc.) in Cubase Mac OS X 32 bit. added the ability to skin the colours of the various graph elements in the UIs (e.g. envelope displays). �� Added 5 new plug-ins: Silent Way ES-5 Controller, Silent Way ESX-4CV Combiner, Silent Way Follower, Silent Way Learner and Silent Way Soundplane. �� 64 bit support (OS X and Windows). �� Added skinning - fully customisable GUIs. �� Added MIDI learn for easy remote control from MIDI control surfaces. �� Added new OSC control features for trivial setup with popular OSC apps such as TouchOSC. �� All plug-ins are now installed in a single bundle (OS X)/dll (Windows). �� Numerous other small fixes and enhancements. new plug-in: SW Learner, providing centralised MIDI learn and OSC support. v2 beta 5 now uses a Silent Way v2 licence. - v2 licences are available to purchase now. - an upgrade from v1 to v2 is $20. - if you purchased v1 in 2012, the upgrade is $10. Contact Expert Sleepers for a discount coupon. This version adds a workaround to the Silent Way Sync plug-in for a Logic Pro bug which could cause erratic clock output. * Fixes the ES-4 Controller plug-in's response to MIDI channels (previously it would respond to mes- sages on any and all MIDI channels) and adds a 'Channelise' capability to the MIDI Out section. The AU Generator variants of the Silent Way DC, Silent Way CV Input, Silent Way LFO and Silent Way Step LFO plug-ins have been replaced by AU Instrument variants, so as to be compatible with AU validation under OS X Lion. Added a 'Reset By Note' option to Silent Way LFO, allowing the LFO to be reset by incoming MIDI note-on messages. Added visual feedback of the LFO's position in its cycle to Silent Way LFO. Added a 'Create ES-4 Calibration' button to Silent Way Quantizer, removing the need to load a suitable calibration file when using the Quantizer with the ES-4 module. Made a slight adjustment to the ES-4 Controller's input processing to match that in the Silent Way Voice Controller and Silent Way Quantizer. 'ES-4 mode', allowing direct use with the Expert Sleepers ES-4 module without routing through the ES-4 Controller plug-in. This version adds an 'output configuration' option to the VST versions of the Silent Way Voice Controller plug-in (Mac OS X and Windows), allowing the plug-in's outputs to be presented to the host as either a 6-channel bus, three stereo busses or six mono busses. When using an audio interface to produce your CVs that is connected via ADAT (for example, the Expert Sleepers ES-3 Lightpipe/CV Interface), and when the audio system is being run at a 'double speed' rate (typically 96kHz), the number of audio channels that can be sent down the ADAT connection is reduced from the usual 8 down to 4. The 4 double-speed channels are multiplexed onto the 8 ADAT channels - this system is usually referred to as 'S/MUX', or sample multiplexing. This update adds multipliers the Silent Way Voice Controller's envelopes, allowing for very long or very short envelope times. This update increases the maximum range of the Silent Way Voice Controller's pitch bend function. This update extends the range of the Silent Way LFO's Beat Divisor parameter down to 1/128th notes. This addresses a problem with setting up the VST versions of the plug-in to output DIN Sync. This update adds a VSTi configuration of the Mac OS X and Windows VST versions of the Silent Way Voice Controller plug-in, so the plug-in can now be used either as an instrument or as an effect. Adds two new plug-ins to the suite - Silent Way Quantizer and Silent Way CV To MIDI. * Added 'Random Tuning' feature to Silent Way Voice Controller. Adds a new plug-in to the suite - Silent Way Step LFO. Dds a new plug-in to the suite - Silent Way CV To OSC. Silent Way CV To OSC translates CV signals (such as those produced by Silent Way CV Input, for example) into OSC messages. These can in turn be used to control all sorts of software and hardware devices. * Added 'swing' feature to Silent Way LFO. The Voice Controller AU now has an effect variant so it will work in Digital Performer. Added new OSC commands (registerOSCPathForParameter() and registerOSCPathForParameterNormalized()) added, primarily for compatibility with TouchOSC. Output conﬁguration changed from a set of drop-down menus to a full matrix of knobs. Envelope scale parameters removed, since the same functionality is now offered by the output matrix. Added velocity-based scaling of envelopes. Areas of the full MIDI note range note covered during calibration are now ﬁlled with 'wrapped around' values from octaves that are covered. Added note priority modes (last/low/high) and retrigger modes (on/off). Fixed some incorrect envelope triggering behaviours. The 'trigger' output is now slightly longer than before (it was previously a single audio sample). fixed blank UI problem in Cubase. This update fixes a problem some users were encountering where only one plug-in's UI would work when multiple plug-ins were opened at the same time.